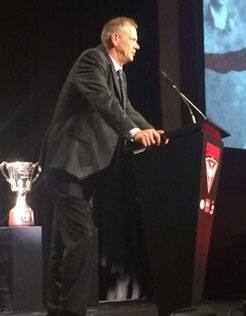 BTV: Paul Vander Haar - 2015 Hall of Fame & Milestones Paul Vander Haar delivers his speech following his induction into the Essendon Football Club's Hall of Fame. Paul Vander Haar played in two premierships for the Bombers. Paul Vander Haar has been celebrated as a selfless teammate on his induction into the Essendon Hall of Fame. ‘The Flying Dutchman’ recalled his early reluctance to leave local football in Ringwood for the heights of the VFL. “I thought it was all too hard, all too difficult,” he said. But a meeting with then Essendon Coach Bill Stephen changed all that. Stephen urged the reluctant star to get the most out of his obvious talent and Vander Haar has been grateful ever since. “It has been a great time – a difficult time – but I’ve enjoyed it,” he said. Vander Haar played in four Grand Finals for the Bombers and two premiership winning teams. Since retiring he’s had knee operations and a knee replacement. He played a brutal style. “I’ve never seen a bloke not take his eye off the ball like Vander,” former Captain Terry Daniher said. Vander Haar retired after the 1990 season, before managers, sponsors and TV rights deals really took hold. “Footy’s never been really financial for me,” he said.